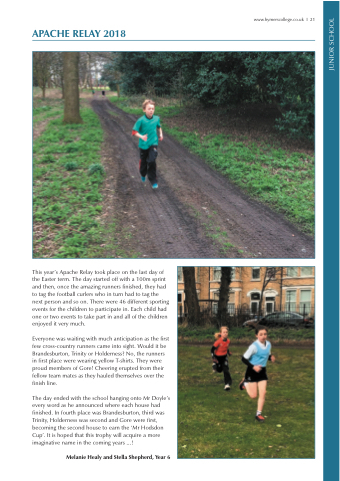 This year’s Apache Relay took place on the last day of the Easter term. The day started off with a 100m sprint and then, once the amazing runners finished, they had to tag the football curlers who in turn had to tag the next person and so on. There were 46 different sporting events for the children to participate in. Each child had one or two events to take part in and all of the children enjoyed it very much. Everyone was waiting with much anticipation as the first few cross-country runners came into sight. Would it be Brandesburton, Trinity or Holderness? No, the runners in first place were wearing yellow T-shirts. They were proud members of Gore! Cheering erupted from their fellow team mates as they hauled themselves over the finish line. The day ended with the school hanging onto Mr Doyle’s every word as he announced where each house had finished. In fourth place was Brandesburton, third was Trinity, Holderness was second and Gore were first, becoming the second house to earn the ‘Mr Hodsdon Cup’. It is hoped that this trophy will acquire a more imaginative name in the coming years ...!